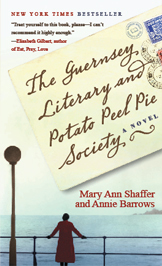 “I am delighted to be reading The Guernsey Literary and Potato Peel Pie Society. Like all good books, it has taken hold of me. I was reading yesterday on a flight from DC to San Fran—and three different people stopped by to talk to me about the book. Two had read it already—another had it recommended by a friend. And I had another conversation about the book when another stranger stopped me as I sat reading outside of a restaurant. I promise, I started none of these conversations. But was happy to be in each. The title alone told me it would be a very interesting book! I was right. From the minute I started it, I spent every spare minute reading it. At first I wondered at the form of the book — could you really tell a story adequately in just letters? With no long paragraphs of description, and pages and pages of dialogue? I didn’t really think I would like that. I was so pleasantly surprised. Reading letters is sort of like “skipping to all the good parts”! I found it was also a very good way to get to know the many characters. The more I got into the story, the more I loved it. Authors Shaffer and Barrows have done a wonderful job in making this such a heart-warming novel. They made their characters so charming, and told their story so well. The individual personalities of the people from Guernsey were so warm, so kind, so generous. They shared the horrible days of The Occupation by the Germans, bonding them to each other in a way nothing else could. There were also many stories told about those days that were not horrible, but showed how loving, loyal, and determined these people were to each other. Juliet had to meet them, and by so doing also became a part of their lives, and they hers. And she chose never to leave. What a beautiful story! It contained all the emotions necessary to grab a reader. The characters were lively and fun, but carried dark experiences through which you couldn’t help but admire them. For me this book had it all. I’m so happy to have read it.